I came very close to embracing an incipient Thanksgiving foodie trend this year and spatchcocking the turkey, as instructed by the Washington Post. But I lost my nerve at the last minute, partly because all the references to spatchcocking I found on the Web other than the Post story described it as a preparation best suited for grilling (it involves slicing through the backbone so you lay the bird flat). Plus the bird (from the Depaola truck at the Union Square greenmarket) was small enough to fit easily in a pot in the fridge. So I went again with what is becoming a pretty conventional Thanksgiving practice (we’ve been doing it for almost a decade) and prepared a brine. I put in a bunch of kosher salt (can’t even remember now if it was 1.5 cups or 2.5), brown sugar, peppercorns, allspice, cloves, rosemary and thyme, and brought it all to a boil. After letting the brine cool down I poured it into the pot with the turkey in it, and didn’t make too much of mess. About 20 hours later I pulled the turkey out (and did make a mess) and put it on its side on a rack in a roasting pan. I roasted it on that side at 400 degrees for 27 minutes (seemed like a good number), flipped it and roasted it on the other side for 27 minutes, then turned the oven down to 350, set the turkey breast side up and put some sweet potatos, parsnips and turnips under it, then poured in some turkey broth and white wine. It probably cooked about 90 or 100 minutes like that. I may have turned the oven down to 325 at some point. It was the first time I had ever cooked a turkey without once consulting a cookbook. And it was good, really good. In past years I’ve sometimes overbrined. 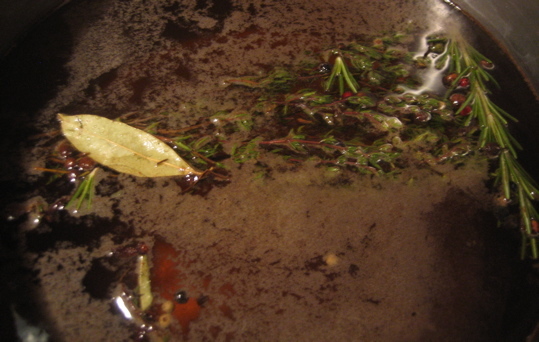 This year the turkey was moist with a hint of the herbs from the brine, but not soft or overspiced. In fact, I’m going to grab a hunk out of the fridge right now. Okay, that’s done. The rest of the menu consisted of smashed potatoes, a really great soup of sweet potatoes and other root veggies that Mrs. By Justin Fox made a few weeks ago, green beans tossed in Dijon mustard and anchovy past. And then there were the sweet potatoes, which I guess were redundant given the soup but we didn’t want to do without. I was initially thinking of slicing them into french-fry pieces and, well, frying them. But there wasn’t an appropriate pot available, so I altered a recipe for grated beets that we’ve been eating a lot of lately (it’s from the Gourmet Cookbook). I grated two sweet potatoes together with one beet, fried ’em up in a skillet with butter like hash browns, then added a little grated lime zest and lime juice at the last minute. It’s better with just beets. 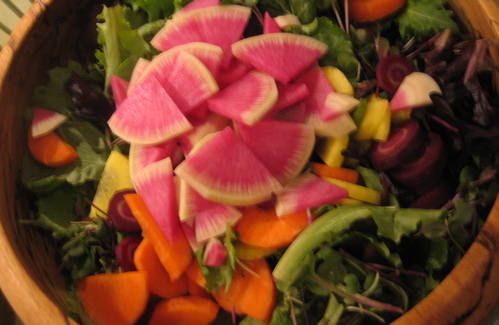 The beautiful watermelon radishes and multicolored carrots were from a really sweet little veggie stand at Union Square near the north entrance to the subway station. I made a dressing of orange juice and shallots and mustard. But it just wasn’t very good. It looked great, though. It was this picture, in fact, that inspired my to write here for the first time in months and months. Not that it’s such a great picture, but the salad was beautiful. Plus, the rest of the family (including in laws) is in the next room working on the annual gingerbread house, which this year is a gas station. I said I was going to get to work on the book (I have a cleaned-up manuscript due Dec. 17), and this procrastination opportunity was just too good to pass up. Happy (post-)Thanksgiving!